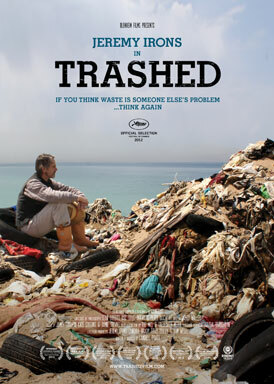 In advance of Earth Day, BAM hosts the documentary film Trashed Sunday evening at 7pm along with a Q&A period with its narrator Jeremy Irons. We buy it, we bury it, we burn it and then we ignore it. Does anyone think about what happens to all the trash we produce? We keep making things that do not break down. We have all heard these horrifying facts before, but with Jeremy Irons as our guide, we discover what happens to the billion or so tons of waste that goes unaccounted for each year. On a boat in the North Pacific he faces the reality of the Great Pacific Garbage Patch and the effect of plastic waste on marine life. We learn that chlorinated dioxins and other man-made Persistent Organic Pollutants are attracted to the plastic fragments. These are eaten by fish, which absorb the toxins. We then eat the fish, accumulating more poisonous chemicals in our already burdened bodies. Meanwhile, global warming, accelerated by these emissions from landfill and incineration, is melting the ice-caps and releasing decades of these old poisons, which had been stored in the ice, back into the sea. And we learn that some of the solutions are as frightening and toxic as the problem itself. For tickets and information, please visit the BAM website. This entry was posted in events, waste on April 18, 2013 by Carl Zimring.